So one of the things about our new house is that the yard is terribly overgrown. Since winter is pretty much here and there’s building supplies all over the small from garden, there’s not much to do. Walking in the shed door one day, I noticed the ground felt a little firmer. Turns out there were pavers under the “grass”. 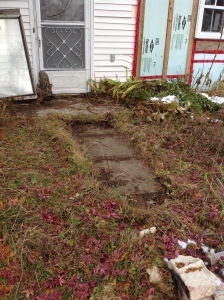 Next time I went to the house for the afternoon, I made sure to grab a shovel and start finding out where the pavers where for the path out the shed door. We’re calling it a shed right now because back door doesn’t seem right. It’s less than twenty feet from the front door, which is on the side of the house, facing the driveway but not the road. The shed can also be reached by a door off the kitchen, so we could call it a mudroom, but right now it’s full of junk and building supplies. Plus a new window. So shed it is. After some careful scraping and figuring out where I could run the edge of the shovel, I found a few pavers and a whole pathway. It doesn’t reach the driveway yet. 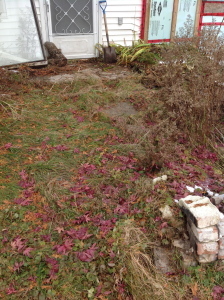 I was stalled by a pile of bricks left in the way from when the old chimney was removed. 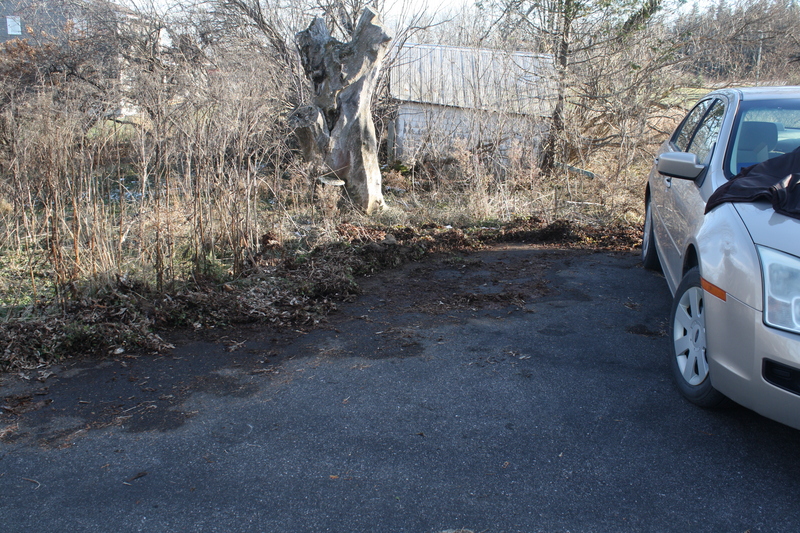 This weekend I again picked up the shovel and worked on clearing out the encroaching weeds and vine plants and dead leaves that were spilling over the backing up space. It’s a handy spot to leave my car so I can just drive out and not back down the entire drive. So here’s today’s work, tho I haven’t shown the other side of the car. This space is wide enough for two cars, but was so overgrown on the edges, as a driver you just weren’t sure where it dropped off onto lawn. Now you can park here just fine. Even though I took up all the space today and parked in the middle. Further on down the driveway there is less work to clear off because it is raised a bit off the field. It’s mostly overgrown by the house itself.